Warm season flows in Palikir Crater (inside Newton crater) on Mars. While there is intriguing but inconclusive evidence suggestive of extraterrestrial liquid water, it has so far eluded direct confirmation. Extraterrestrial liquid water (from the Latin words: extra ["outside of, beyond"] and terrestris ["of or belonging to Earth"]) is water in its liquid state that is found beyond Earth. It is a subject of wide interest because it is commonly thought to be one of the key prerequisites for extraterrestrial life. With oceanic water covering 71% of its surface, Earth is the only planet known to have stable bodies of liquid water on its surface, and liquid water is essential to all known life forms on Earth. The presence of water on the surface of Earth is a product of its atmospheric pressure and a stable orbit in the Sun's circumstellar habitable zone, though the origin of Earth's water remains unknown. 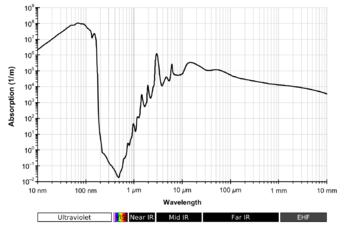 The main methods currently used for confirmation are absorption spectroscopy and geochemistry. These techniques have proven effective for atmospheric water vapour and ice. However, using current methods of astronomical spectroscopy it is substantially more difficult to detect liquid water on terrestrial planets, especially in the case of subsurface water. Due to this, astronomers, astrobiologists and planetary scientists use habitable zone, gravitational and tidal theory, models of planetary differentiation and radiometry to determine potential for liquid water. Water observed in volcanic activity can provide more compelling indirect evidence, as can fluvial features and the presence of antifreeze agents, such as salts or ammonia. Using such methods, many scientists infer that liquid water once covered large areas of Mars and Venus. Water is thought to exist as liquid beneath the surface of some planetary bodies, similar to groundwater on Earth. Water vapour is sometimes considered conclusive evidence for the presence of liquid water, although atmospheric water vapour may be found to exist in many places where liquid water does not. Similar indirect evidence, however, supports the existence of liquids below the surface of several moons and dwarf planets elsewhere in the Solar System. Some are speculated to be large extraterrestrial "oceans". Liquid water is thought to be common in other planetary systems, despite the lack of conclusive evidence, and there is a growing list of extrasolar candidates for liquid water. As of December 2015, the confirmed liquid water in the Solar System outside Earth is 25-50 times the volume of Earth's water (1.3 billion cubic kilometers). Water on Mars exists today almost exclusively as ice, with a small amount present in the atmosphere as vapour. Some liquid water may occur transiently on the Martian surface today but only under certain conditions. No large standing bodies of liquid water exist because the atmospheric pressure at the surface averages just 600 pascals (0.087 psi)—about 0.6% of Earth's mean sea level pressure—and because the global average temperature is far too low (210 K (−63 °C)), leading to either rapid evaporation or freezing. On 28 September 2015, NASA announced that they found evidence that the recurring slope lineae are caused by flows of brine — hydrated salts. Scientists' consensus is that a layer of liquid water exists beneath Europa's (moon of Jupiter) surface, and that heat from tidal flexing allows the subsurface ocean to remain liquid. It is estimated that the outer crust of solid ice is approximately 10–30 km (6–19 mi) thick, including a ductile "warm ice" layer, which could mean that the liquid ocean underneath may be about 100 km (60 mi) deep. This leads to a volume of Europa's oceans of 3 × 1018 m3, slightly more than two times the volume of Earth's oceans. Enceladus, a moon of Saturn, has shown geysers of water, confirmed by the Cassini spacecraft in 2005 and analyzed more deeply in 2008. Gravimetric data in 2010-2011 confirmed a subsurface ocean. While previously believed to be localized, most likely in a portion of the southern hemisphere, evidence revealed in 2015 now suggests the subsurface ocean is global in nature. In addition to water, these geysers from vents near the south pole contained small amounts of salt, nitrogen, carbon dioxide, and volatile hydrocarbons. The melting of the ocean water and the geysers appear to be driven by tidal flux from Saturn. A subsurface saline ocean is theorized to exist on Ganymede, a moon of Jupiter, following observation by the Hubble Space Telescope in 2015. Patterns in auroral belts and rocking of the magnetic field suggest the presence of an ocean. It is estimated to be 100 km deep with the surface lying below a crust of 150 km of ice. Ceres appears to be differentiated into a rocky core and icy mantle, and may have a remnant internal ocean of liquid water under the layer of ice. The surface is probably a mixture of water ice and various hydrated minerals such as carbonates and clay. In January 2014, emissions of water vapor were detected from several regions of Ceres. This was unexpected, because large bodies in the asteroid belt do not typically emit vapor, a hallmark of comets. Ceres also features a mountain called Ahuna Mons that is thought to be a cryovolcanic dome that facilitates the movement of high viscosity cryovolcanic magma consisting of water ice softened by its content of salts. NASA's Goddard Institute for Space Studies and others have postulated that Venus may have had a shallow ocean in the past for up to 2 billion years, with as much water as Earth. Depending on the parameters used in their theoretical model, the last liquid water could have evaporated as recently as 715 million years ago. Currently, the only known water on Venus is in the form of a tiny amount of atmospheric vapor (20 ppm). Hydrogen, a component of water, is still being lost to space nowadays as detected by ESA's Venus Express spacecraft. Most known extrasolar planetary systems appear to have very different compositions to the Solar System, though there is probably sample bias arising from the detection methods. Liquid water has not been detected in spectroscopic analysis of suspected seasonal Martian flows. The most conclusive method for detection and confirmation of extraterrestrial liquid water is currently absorption spectroscopy. Liquid water has a distinct spectral signature to other states of water due to the state of its hydrogen bonds. Despite the confirmation of extraterrestrial water vapor and ice, the spectral signature of liquid water is yet to be confirmed. The signatures of surface water on terrestrial planets may be undetectable through thick atmospheres across the vast distances of space using current technology. Seasonal flows on warm Martian slopes, though strongly suggestive of briny liquid water, have yet to indicate this in spectroscopic analysis. 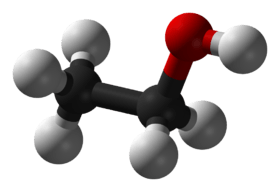 Water vapor has been confirmed in numerous objects via spectroscopy, though it does not by itself confirm the presence of liquid water. However, when combined with other observations, the possibility might be inferred. For example, the density of GJ 1214 b would suggest that a large fraction of its mass is water and follow-up detection by the Hubble telescope of the presence if water vapor strongly suggests that exotic materials like 'hot ice' or 'superfluid water' may be present. Thomas Gold has posited that many Solar System bodies could potentially hold groundwater below the surface. It is thought that liquid water may exist in the Martian subsurface. Research suggests that in the past there was liquid water flowing on the surface, creating large areas similar to Earth's oceans. However, the question remains as to where the water has gone. There are a number of direct and indirect proofs of water's presence either on or under the surface, e.g. stream beds, polar caps, spectroscopic measurement, eroded craters or minerals directly connected to the existence of liquid water (such as Goethite). In an article in the Journal of Geophysical Research, scientists studied Lake Vostok in Antarctica and discovered that it may have implications for liquid water still being on Mars. Through their research, scientists came to the conclusion that if Lake Vostok existed before the perennial glaciation began, that it is likely that the lake did not freeze all the way to the bottom. Due to this hypothesis, scientists say that if water had existed before the polar ice caps on Mars, it is likely that there is still liquid water below the ice caps that may even contain evidence of life. "Chaos terrain", a common feature on Europa's surface, is interpreted by some as regions where the subsurface ocean has melted through the icy crust. Geysers have been found on Enceladus, a moon of Saturn, and Europa, moon of Jupiter. These contain water vapour and could be indicators of liquid water deeper down. It could also be just ice. In June 2009, evidence was put forward for salty subterranean oceans on Enceladus. On April 3, 2014, NASA reported that evidence for a large underground ocean of liquid water on Enceladus, moon of planet Saturn, had been found by the Cassini spacecraft. According to the scientists, evidence of an underground ocean suggests that Enceladus is one of the most likely places in the solar system to "host microbial life". Scientists' consensus is that a layer of liquid water exists beneath Europa's surface, and that heat energy from tidal flexing allows the subsurface ocean to remain liquid. The first hints of a subsurface ocean came from theoretical considerations of tidal heating (a consequence of Europa's slightly eccentric orbit and orbital resonance with the other Galilean moons). Scientists used gravitational measurements from the Cassini spacecraft to confirm a water ocean under the crust of Enceladus. Such tidal models have been used as theories for water layers in other Solar System moons. Artists conception of the subsurface water ocean confirmed on Enceladus in 2014 as calculated using gravitational measurements and density estimations. Planetary scientists can use calculations of density to determine the composition of planets and their potential to possess liquid water, though the method is not highly accurate as the combination of many compounds and states can produce similar densities. Scientists used low frequency radio signal from the Cassini probe to detect the existence of a layer of liquid water and ammonia beneath the surface of Saturn's moon Titan that are consistent with calculations of the moon's density. Initial analysis of 55 Cancri e's low density indicated that it consisted 30% supercritical fluid which Diana Valencia of the Massachusetts Institute of Technology proposed could be in the form of salty supercritical water, though follow-up analysis of its transit failed to detect traces of either water or hydrogen. GJ 1214 b was the second exoplanet (after CoRoT-7b) to have an established mass and radius less than those of the giant Solar System planets. It is three times the size of Earth and about 6.5 times as massive. Its low density indicated that it is likely a mix of rock and water, and follow-up observations using the Hubble telescope now seem to confirm that a large fraction of its mass is water, so it is a large waterworld. 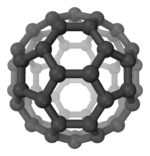 The high temperatures and pressures would form exotic materials like 'hot ice' or 'superfluid water'. Models of radioactive decay suggest that MOA-2007-BLG-192Lb, a small planet orbiting a small star could be as warm as the Earth and completely covered by a very deep ocean. Models of Solar System objects indicate the presence of liquid water in their internal differentiation. Some models of the dwarf planet Ceres, largest object in the asteroid belt indicate the possibility of a wet interior layer. Water vapor detected to be emitted by the dwarf planet may be an indicator, thought sublimation of surface ice. A global layer of liquid water thick enough to decouple the crust from the mantle is thought to be present on Titan, Europa and, with less certainty, Callisto, Ganymede and Triton. 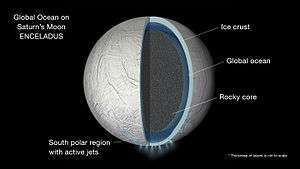 Other icy moons may also have internal oceans, or have once had internal oceans that have now frozen. A planet's orbit in the circumstellar habitable zone is a popular method used to predict its potential for surface water at its surface. Habitable zone theory has put forward several extrasolar candidates for liquid water, though they are highly speculative as a planet's orbit around a star alone does not guarantee that a planet it has liquid water. In addition to its orbit, a planetary mass object must have the potential for sufficient atmospheric pressure to support liquid water and a sufficient supply of hydrogen and oxygen at or near its surface. The Gliese 581 system contains multiple planets that may be candidates for surface water, including Gliese 581 c, Gliese 581 d might be warm enough for oceans if a greenhouse effect was operating, Gliese 581 e.
Gliese 667 C has three of them are in the habitable zone including Gliese 667 Cc is estimated to have surface temperatures similar to Earth and a strong chance of liquid water. Kepler-22b one of the first 54 candidates found by the Kepler telescope and reported is 2.4 times the size of the Earth, with an estimated temperature of 22 °C. It is described as having the potential for surface water, though its composition is currently unknown. Among the 1,235 possible extrasolar planet candidates detected by NASA's planet-hunting Kepler space telescope during its first four months of operation, 54 are orbiting in the parent star's habitable 'Goldilocks' zone where liquid water could exist. Five of these are near Earth-size. On 6 January 2015, NASA announced further observations conducted from May 2009 to April 2013 which included eight candidates between one and two times the size of Earth, orbiting in a habitable zone. Of these eight, six orbit stars that are similar to the Sun in size and temperature. Three of the newly confirmed exoplanets were found to orbit within habitable zones of stars similar to the Sun: two of the three, Kepler-438b and Kepler-442b, are near-Earth-size and likely rocky; the third, Kepler-440b, is a super-Earth. Before space probes were landed, the idea of oceans on Venus was credible science, but the planet was discovered to be much too hot. Telescopic observations from the time of Galileo onward have shown that Mars has no features resembling watery oceans. Mars' dryness was long recognized, and gave credibility to the spurious Martian canals. Assuming that the Giant impact hypothesis is correct, there were never real seas or oceans on the Moon, only perhaps a little moisture (liquid or ice) in some places, when the Moon had a thin atmosphere created by degassing of volcanoes or impacts of icy bodies. The Dawn space probe found possible evidence of past water flow on the asteroid Vesta, leading to speculation of underground reservoirs of water-ice. Astronomers speculate that Venus had liquid water and perhaps oceans in its very early history. Given that Venus has been completely resurfaced by its own active geology, the idea of a primeval ocean is hard to test. Rock samples may one day give the answer. It was once thought that Mars might have dried up from something more Earth-like. The initial discovery of a cratered surface made this seem unlikely, but further evidence has changed this view. Liquid water may have existed on the surface of Mars in the distant past, and several basins on Mars have been proposed as dry sea beds. The largest is Vastitas Borealis; others include Hellas Planitia and Argyre Planitia. There is currently much debate over whether Mars once had an ocean of water in its northern hemisphere, and over what happened to it if it did. Recent findings by the Mars Exploration Rover mission indicate it had some long-term standing water in at least one location, but its extent is not known. The Opportunity Mars rover photographed bright veins of a mineral leading to conclusive confirmation of deposition by liquid water. On December 9, 2013, NASA reported that the planet Mars had a large freshwater lake (which could have been a hospitable environment for microbial life) based on evidence from the Curiosity rover studying Aeolis Palus near Mount Sharp in Gale Crater. Comets contain large proportions of water ice, but are generally thought to be completely frozen due to their small size and large distance from the Sun. However, studies on dust collected from comet Wild-2 show evidence for liquid water inside the comet at some point in the past. It is yet unclear what source of heat may have caused melting of some of the comet's water ice. Nevertheless, on 10 December 2014, scientists reported that the composition of water vapor from comet Churyumov–Gerasimenko, as determined by the Rosetta spacecraft, is substantially different from that found on Earth. That is, the ratio of deuterium to hydrogen in the water from the comet was determined to be three times that found for terrestrial water. This makes it very unlikely that water found on Earth came from comets such as comet Churyumov–Gerasimenko according to the scientists. The goal of current searches is to find Earth-sized planets in the habitable zone of their planetary systems (also sometimes called the Goldilocks zone). Planets with oceans could include Earth-sized moons of giant planets, though it remains speculative whether such 'moons' really exist. The Kepler telescope might be sensitive enough to detect them. There is speculation that rocky planets hosting water may be commonplace throughout the Milky Way. I say then that if there were in nature only one way for two surfaces to be illuminated by the sun so that one appears lighter than the other, and that this were by having one made of land and the other of water, it would be necessary to say that the moon's surface was partly terrene and partly aqueous. But because there are more ways known to us that could produce the same effect, and perhaps others that we do not know of, I shall not make bold to affirm one rather than another to exist on the moon... What is clearly seen in the moon is that the darker parts are all plains, with few rocks and ridges in them, though there are some. The brighter remainder is all fill of rocks, mountains, round ridges, and other shapes, and in particular there are great ranges of mountains around the spots... I think that the material of the lunar globe is not land and water, and this alone is enough to prevent generations and alterations similar to ours. 1 2 3 Dyches, Preston; Chou, Felcia (7 April 2015). "The Solar System and Beyond is Awash in Water". NASA. Retrieved 8 April 2015. ↑ "Mars Probably Once Had A Huge Ocean". Sciencedaily.com. 2007-06-13. Retrieved 2012-01-22. ↑ Owen, James (November 28, 2007). "Venus Craft Reveals Lightning, Supports Watery Past". National Geographic News. Retrieved 2016-09-07. ↑ "Our Solar System Is Overflowing with Liquid Water [Graphic]". Scientific American. Retrieved 2015-12-28. ↑ ""NASA Mars Spacecraft Reveals a More Dynamic Red Planet".". ↑ Sample, Ian (28 September 2015). "Nasa scientists find evidence of flowing water on Mars". The Guardian. Retrieved 28 September 2015. ↑ Wall, Mike (28 September 2015). "Salty Water Flows on Mars Today, Boosting Odds for Life". Space.com. Retrieved 2015-09-28. ↑ Ojha, Lujendra; Wilhelm, Mary Beth; Murchie, Scott L.; McEwen, Alfred S.; et al. (28 September 2015). "Spectral evidence for hydrated salts in recurring slope lineae on Mars". Nature Geoscience. 8: 829–832. Bibcode:2015NatGe...8..829O. doi:10.1038/ngeo2546. Retrieved 2015-09-28. ↑ "Water near surface of a Jupiter moon only temporary". ↑ Keith Wagstaff. "Saturn's Moon Enceladus Is Home to a Global Ocean". NBC News. Retrieved 3 October 2015. ↑ ""NASA's Hubble Observations Suggest Underground Ocean on Jupiter's Largest Moon".". ↑ McCord, T. B.; Sotin, C. (21 May 2005). "Ceres: Evolution and current state". Journal of Geophysical Research: Planets. 110 (E5): E05009. Bibcode:2005JGRE..110.5009M. doi:10.1029/2004JE002244. Retrieved 7 March 2015. ↑ "Dawn Mission - News - Detail". nasa.gov. ↑ Redd, Nola Taylor. "Water Ice on Ceres Boosts Hopes for Buried Ocean [Video]". Scientific American. Retrieved 2016-04-07. ↑ Carey, Bjorn (7 September 2005). "Largest Asteroid Might Contain More Fresh Water than Earth". SPACE.com. Archived from the original on 5 October 2011. Retrieved 16 August 2006. ↑ NASA Science News: Water Detected on Dwarf Planet Ceres , by Production editor: Tony Phillips | Credit: Science@NASA. 22 January 2014. ↑ Skibba, R. (2016-09-01). "Giant ice volcano spotted on dwarf planet Ceres". Nature. doi:10.1038/nature.2016.20526. ↑ Ruesch, O.; Platz, T.; Schenk, P.; McFadden, L. A.; Castillo-Rogez, J. C.; Quick, L. C.; Byrne, S.; Preusker, F.; OBrien, D. P.; Schmedemann, N.; Williams, D. A.; Li, J.- Y.; Bland, M. T.; Hiesinger, H.; Kneissl, T.; Neesemann, A.; Schaefer, M.; Pasckert, J. H.; Schmidt, B. E.; Buczkowski, D. L.; Sykes, M. V.; Nathues, A.; Roatsch, T.; Hoffmann, M.; Raymond, C. A.; Russell, C. T. (2016-09-02). "Cryovolcanism on Ceres". Science. 353 (6303): aaf4286–aaf4286. doi:10.1126/science.aaf4286. ↑ Michael Cabbage and Leslie McCarthy (11 August 2016). "NASA climate modeling suggests Venus may have been habitable". NASA. Retrieved 19 November 2016. ↑ Shannon Hall (10 August 2016). "Hellish Venus Might Have Been Habitable for Billions of Years". Scientific American. Retrieved 19 November 2016. 1 2 "Where did Venus's water go?". European Space Agency. 18 December 2008. Retrieved 19 November 2016. ↑ Basilevsky, Alexandr T.; Head, James W. (2003). "The surface of Venus". Rep. Prog. Phys. 66 (10): 1699–1734. Bibcode:2003RPPh...66.1699B. doi:10.1088/0034-4885/66/10/R04. ↑ Bertaux, Jean-Loup; Vandaele, Ann-Carine; Korablev, Oleg; Villard, E.; Fedorova, A.; Fussen, D.; Quémerais, E.; Belyaev, D.; et al. (2007). "A warm layer in Venus' cryosphere and high-altitude measurements of HF, HCl, H2O and HDO". Nature. 450 (7170): 646–649. Bibcode:2007Natur.450..646B. doi:10.1038/nature05974. PMID 18046397. 1 2 "Distant 'water-world' confirmed". BBC News. Retrieved 3 October 2015. 1 2 "Hubble Reveals a New Class of Extrasolar Planet". Retrieved 3 October 2015. ↑ "Science@NASA, The Case of the Missing Mars Water". Retrieved 2009-03-07. ↑ "Water on Mars: Where is it All?". Retrieved 2009-03-07. ↑ "Water at Martian south pole". 17 March 2004. Retrieved 29 September 2009. ↑ "A numerical model for an alternative origin of Lake Vostok and its exobiological implications for Mars". Retrieved 2009-04-08. ↑ Cook, Jia-Rui C.; Gutro, Rob; Brown, Dwayne; Harrington, J.D. ; Fohn, Joe (12 December 2013). "Hubble Sees Evidence of Water Vapor at Jupiter Moon". NASA. Retrieved 12 December 2013. ↑ "Cassini Images of Enceladus Suggest Geysers Erupt Liquid Water at the Moon's South Pole". Ciclops.org. 2006-03-09. Retrieved 2012-01-22. ↑ "Saturn's Moon Enceladus Is Unlikely To Harbor Life". Sciencedaily.com. 2007-08-14. Retrieved 2012-01-22. ↑ "Possible salty ocean hidden in depths of Saturn moon". Astronomynow.com. 2009-06-25. Retrieved 2012-01-22. 1 2 3 Platt, Jane; Bell, Brian (3 April 2014). "NASA Space Assets Detect Ocean inside Saturn Moon". NASA. Retrieved 3 April 2014. 1 2 3 Iess, L.; Stevenson, D.J. ; Parisi, M.; Hemingway, D.; Jacobson, R.A.; Lunine, J.I. ; Nimmo, F.; Armstrong, J.w. ; Asmar, S.w. ; Ducci, M.; Tortora, P. (4 April 2014). "The Gravity Field and Interior Structure of Enceladus". Science. 344 (6179): 78–80. Bibcode:2014Sci...344...78I. doi:10.1126/science.1250551. Retrieved 3 April 2014. ↑ Greenberg, Richard (2005) Europa: The Ocean Moon: Search for an Alien Biosphere, Springer + Praxis Books, ISBN 978-3-540-27053-9. ↑ "Mysterious signal hints at subsurface ocean on Titan". Space.newscientist.com. Retrieved 2012-01-22. ↑ Briggs, Helen (2008-03-20). "Saturn moon may have hidden ocean". BBC News. Retrieved 2012-01-22. ↑ "Astrophile: Supercritical water world does somersaults". Newscientist.com. Retrieved 2012-01-22. ↑ "The small planet with a thick coat". Astronomynow.com. 2009-12-17. Retrieved 2012-01-22. 1 2 3 4 Hussmann, Hauke; Sohl, Frank; Spohn, Tilman (November 2006). "Subsurface oceans and deep interiors of medium-sized outer planet satellites and large trans-neptunian objects" (PDF). Icarus. 185 (1): 258–273. Bibcode:2006Icar..185..258H. doi:10.1016/j.icarus.2006.06.005. ↑ "Small Planet Discovered Orbiting Small Star". Sciencedaily.com. 2008-06-02. Retrieved 2012-01-22. ↑ Küppers, Michael; O’Rourke, Laurence; Bockelée-Morvan, Dominique; Zakharov, Vladimir; Lee, Seungwon; von Allmen, Paul; Carry, Benoît; Teyssier, David; Marston, Anthony; Müller, Thomas; Crovisier, Jacques; Barucci, M. Antonietta; Moreno, Raphael (2014). "Localized sources of water vapour on the dwarf planet (1) Ceres". Nature. 505 (7484): 525–527. Bibcode:2014Natur.505..525K. doi:10.1038/nature12918. ISSN 0028-0836. PMID 24451541. ↑ Harrington, J.D. (22 January 2014). "Herschel Telescope Detects Water on Dwarf Planet - Release 14-021". NASA. Retrieved 22 January 2014. ↑ Javier Ruiz (December 2003). "Heat flow and depth to a possible internal ocean on Triton". Icarus. 166 (2): 436–439. Bibcode:2003Icar..166..436R. doi:10.1016/j.icarus.2003.09.009. ↑ "New Planet Could Harbor Water and Life". Space.com. 2007-04-24. Retrieved 2012-01-22. ↑ "Scientists might have picked right star, wrong world for hosting life". MSNBC. 2007-06-18. Retrieved 2012-01-22. ↑ "Exoplanet near Gliese 581 star 'could host life'". BBC News. 2011-05-17. Retrieved 2012-01-22. ↑ "Three Planets in Habitable Zone of Nearby Star: Gliese 667c Reexamined". Retrieved 3 October 2015. ↑ "Super-Earth orbits in habitable zone of cool star". Retrieved 3 October 2015. ↑ "Kepler 22-b: Earth-like planet confirmed". BBC News. 2011-12-05. Retrieved 2012-01-22. ↑ "Kepler detects more than 1,200 possible planets". Spaceflightnow.com. Retrieved 2012-01-22. ↑ "NASA Finds Earth-Size Planet Candidates in Habitable Zone, Six Planet System". Sciencedaily.com. 2011-02-02. doi:10.1038/nature09760. Retrieved 2012-01-22. ↑ Clavin, Whitney; Chou, Felicia; Johnson, Michele (6 January 2015). "NASA's Kepler Marks 1,000th Exoplanet Discovery, Uncovers More Small Worlds in Habitable Zones". NASA. Retrieved 6 January 2015. ↑ "Dawn probe spies possible water-cut gullies on Vesta". BBC News. Retrieved 3 October 2015. ↑ "Huge Asteroid Vesta May Be Packed With Water Ice". Space.com. Retrieved 3 October 2015. ↑ Did oceans on Venus harbour life?, issue 2626 of New Scientist magazine. ↑ Jpl.Nasa.Gov. 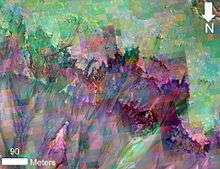 "NASA Mars Rover Finds Mineral Vein Deposited by Water — NASA Jet Propulsion Laboratory". Jpl.nasa.gov. Retrieved 2012-01-22. ↑ Chang, Kenneth (December 9, 2013). "On Mars, an Ancient Lake and Perhaps Life". New York Times. Retrieved December 9, 2013. ↑ "Frozen comet's watery past: Discovery challenges paradigm of comets as 'dirty snowballs' frozen in time". Sciencedaily.com. 2011-04-05. doi:10.1016/j.gca.2011.03.026. Retrieved 2012-01-22. ↑ Agle, DC; Bauer, Markus (10 December 2014). "Rosetta Instrument Reignites Debate on Earth's Oceans". NASA. Retrieved 10 December 2014. ↑ Chang, Kenneth (10 December 2014). "Comet Data Clears Up Debate on Earth's Water". New York Times. Retrieved 10 December 2014. 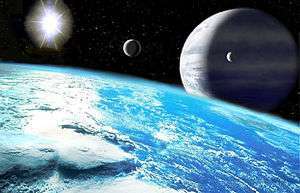 ↑ "Habitable planets may be common". Newscientist.com. Retrieved 2012-01-22. ↑ "The hunt for habitable exomoons". Astronomynow.com. 2009-09-04. Retrieved 2012-01-22. ↑ "Water, water everywhere". Astronomynow.com. Retrieved 2012-01-22. 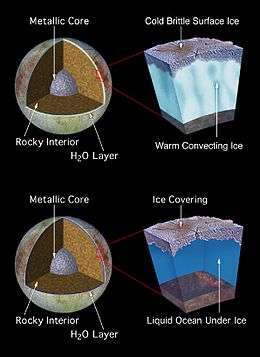 Jupiter's Moon Europa: What Could Be Under The Ice?